The Ethiopia Field Station (EFS) is based in Addis Ababa, the capital of Ethiopia, and operates along with a substation established in South Omo Zone in the Southern Nations, Nationalities, and Peoples Region. 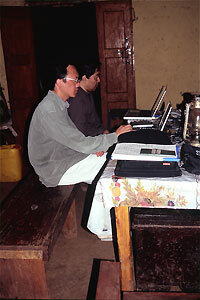 In October FY2003, when the Field Station Cooperative Workshop "Environment, Livelihood and Local Praxis in Asia and Africa," was held under joint sponsorship with the University of Addis Ababa, six ASAFAS faculty members and 15 ASAFAS graduate students were dispatched overseas, funded by the 21st Century COE Program, and they conducted education and research activities capitalizing on the functions of the EFS. In addition, three ASAFAS faculty members and five ASAFAS graduate students, whose visit was financed by sources outside of the 21st Century COE Program, also used the EFS. Further, faculty members and graduate students from other faculties of Kyoto University and other universities carrying out education and research in Ethiopia also availed themselves of the EFS's functions. In the first half of his visit from July 17 to August 15, SHIGETA Masayoshi (ASAFAS faculty member) took part in the 15th International Conference of Ethiopian Studies held in Hamburg, Germany along with six ASAFAS graduate students (KANEKO, NISHIZAKI, MAMO, KAWASE, DANIEL and BELLE), and made a presentation of achievements related to the activities of the EFS. In the latter half of his visit, he moved to Ethiopia and engaged in activities to develop and improve the EFS and to prepare the Field Station Cooperative Workshop co-sponsored by Addis Ababa University. He also implemented on-site education for Belle Asante (enrolled in FY2002) in Harar, Eastern Ethiopia. Andy Amri (FY1998); October 19-29, 2003; Indonesia Makassar FS; 21st Century COE Program; "Studies on Silvo-Fishery Systems and Natural Resource Management in the Coastal Areas of South Sulawesi, Indonesia"
ITOH Yoshimasa (FY2003); October 3, 2003 - January 6, 2004; Cameroon FS; non-21COE program; "Community Changes Brought About by the Development of Education in African Rural Communities and an Education Model and Its Potential in These Communities"
ODA Yukiyo (FY1999); August 30, 2003 - May 31, 2004; Cameroon FS; 21st Century COE Program; "Women Who Choose to Be Beauticians: A Study on Newly Developing Female Occupations in Urban Areas in Ghana"
OGAWA Sayaka (FY2000); October 5, 2003 - July 5, 2004; Tanzania FS; 21st Century COE Program; "A Study on Changes of Commercial Sectors after the Economic Liberalization in Tanzania: A Case Study of Used Clothes Distribution in Mwanza, a Major Local City"
KANEKO Morie (FY1998); October 20 - November 7, 2003; Ethiopia FS; 21st Century COE Program; "Manufacturing Processes Undergoing Contextualization: A Case Study of a Professional Pottery Making Group of Omo Ari Peasants, Southwestern Ethiopia"
KAWASE Itsushi (FY2001); September 26, 2003 - August 31, 2004; Ethiopia FS; 21st Century COE Program; "Musical-Anthropological Study of Ethiopian Azmari and Lalibalocc minstrels"
KOIZUMI Miyako (FY2001); October 19 - 29, 2003; Indonesia Bogor FS; 21st Century COE Program; "Ethnobotany of the Penan Benalui of East Kalimantan"
SAGAWA Toru (FY2000); October 4 - December 27, 2003; Ethiopia FS; 21st Century COE Program; "Gender and Sphere of Activities in a Dasanetch Community in Southwestern Ethiopia"
SUZUKI Ikuno (FY2002); September 5 - December 5, 2003; Ethiopia FS; non-21COE program; "The Relationship between Public Education and Traditional Organizations in the Ari District, Southwestern Ethiopia"
NAITO Naoki (FY1998); October 18 - November 16, 2003; Kenya FS; Grant-in-Aid for Scientific Research; "Anthropological Study on Livelihood Changes in African Tribal Pastoral Communities and the Dynamism of Their Ethnic Relationships"
NISHI Makoto (enrolled as a third year student in FY2003); September 22 - December 19, 2003; Ethiopia FS; 21st Century COE Program; "Communities and Publicness Created by Traditional Organizational Activities in Ethiopia"
NISHIZAKI Nobuko (FY1999); September 22 - November 10, 2003; Ethiopia FS; 21st Century COE Program; "The Relationship between Wildlife Sanctuaries and Communities in Ethiopia: Review of the Role of Communities in Wildlife Conservation"
HATTORI Shiho (FY1999); October 18, 2003 - September 1, 2004; Cameroon FS; 21st Century COE Program; "How Nature Conservation Projects Affect Hunter-Gatherers: A Case Study of Baka Pygmies in the Tropical Rainforest in the East Province of Cameroon"
HIRAI Masakimi (FY2001); October 16, 2003 - February 10, 2004; Cameroon FS; 21st Century COE Program; "Process of Making ‘Wooded Fields' in Central Senegal"
FUJII Miho (FY1999); October 19 - 29, 2003; 21st Century COE Program; "Social Change in a Philippine Coconut Farming Village: A Case Study in Laguna Province"
Belle Asante (FY2002); August 1 - October 30, 2003; Ethiopia FS; non-21COE program; "The Impact of the Activities of a Voluntary Women's Association on the Basket Weaving Tradition of the Harari in Ethiopia"
Mamo Hebo (FY1999); October 19 - November 2, 2003; Ethiopia FS; 21st Century COE Program; "Land Tenure Changes, Land Disputes and Mechanisms of Land Dispute Resolution among the Arsii Oromo of Southern Ethiopia"
MURAO Rumiko (FY2000); October 18, 2003 - September 30, 2004; Zambia FS; 21st Century COE Program; "A Study on the Agricultural System in the Kalahari Sand Areas of Western Zambia"
MORISHITA Keiko (FY1997); June 14, 2003 - May 31, 2004; non-21COE program; "Mutual Influence between People and NGOs in African Farming Communities"
Lim Boon Hock (FY1999); October 19 - 29, 2003; 21st Century COE Program; "The Salt Industry in Bangladesh: Past and Present"
YAMAMOTO Yudai (FY2001); December 20, 2002 - July 2, 2003; non-21COE program; Ethiopia; "People's Praxis that Surrounds Chat, a Nonessential Grocery Food Crop: Its Production, Distribution and Consumption in Sidama, Southern Ethiopia"
Daniel Baheta (FY2000); July 20 - November 20, 2003; 21st Century COE Program; Eritrea; "The Development of Education and Social Change in Eritrea"
SUZUKI Ikuno (ASAFAS graduate student) talks with research collaborators at the EFS Southern Omo substation. NISHI Makoto (ASAFAS graduate student) and SHIGETA Masayoshi (ASAFAS faculty member) exchange e-mails and update the website using a satellite communication system. Bethlehem Tekola (graduate student of Addis Ababa University, Graduate School of Anthropology), gives a presentation at the Field Station Cooperative Workshop. 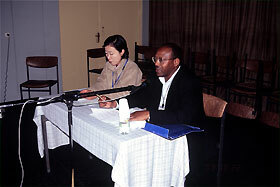 Tadese Beriso (Deputy Director, Institute of Ethiopian Studies, Addis Ababa University), chairs the Field Station Cooperative Workshop, and HATTORI Shiho (ASAFAS graduate student) acts as MC. EFS has rented private lodging facilities since July 2003 to be used as a base for education and research activities. Further, a substation was established in Metsa Village in the South Omo Zone in Southern Nations, Nationalities, and Peoples Region to serve as a center for ASAFAS graduate students conducting research activities in the neighboring area. Both the EFS and the substation have organized seminars and joint workshops as needed. The EFS developed a system that facilitates contacts by e-mail as needed with the substation, Kyoto and the field of each of the dispatched graduate students using an R-BGAN satellite communication system. The EFS's website was launched in the process of organizing the Field Station Cooperative Workshop. A joint research was carried out on the urban generation in the South Omo Zone, headed by Dr. Abdusamad Ahmad, former Director of the Institute of Ethiopian Studies of Addis Ababa University. Dr. Ahmad stayed in Japan for three months from January 2004 as a visiting professor of ASAFAS. 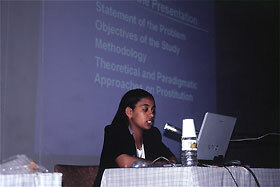 "Area Studies on the Environmental Conservation Function of African-style Livelihood Systems," a joint research funded by Grant-in-Aid for Scientific Research was promoted in cooperation with the faculty members and graduate students of the Department of Sociology and Social Anthropology, College of Social Science, Addis Ababa University. Support was given to master's course graduate students of the Department of Sociology and Social anthropology, College of Social Science, Addis Ababa University for their fieldwork.